Linda Robinson blogs again about her latest trip to France. I am honoured to host her writings. Please read and share. The horror of what is happening is being ignored by the press because of Brexit and elections. But this stuff matters too – it is a humanitarian crisis on our doorstep. Back in Calais a little apprehensive as to what to expect this time and how l was going to cope with seeing so many refugees sleeping rough with no protection from the very changeable weather. I arrived at the warehouse and unloaded all our donations which were mainly sleeping bags and plastic ground mats. I had also bought some formula milk in the hope that the volunteers had been made aware that much of the powdered milk being given out for babies was unsafe. The mats being the brain wave of Rachel Dodsley who got together a team of supporters, and with Rachel’s help crocheted cut up plastic bags – each mat taking 7 to 9 hours to make. A really amazing effort from everyone concerned. The sleeping bags l took were part of the money raised by Francesca Trafford and Harry Parkhouse who held a gourmet meal for 85 of their friends. This allowed me to actually take the money to Calais and buy whatever was the most needed on the day. Food was definitely high on the agenda. Also money was raised by holding a cake stall in the town centre. A big thank you to Nikki Sweeney and her friends for supporting the refugees’ plight. One little lad even gave Nikki his pocket money when she told him where the money was going to. A very heartening moment. To have the support from so many that have given the time to raise the funds to help me achieve all that l wanted to do on this trip has been a huge act of human kindness. I just wish you could all see the smiles on the refugee’s faces, it is truly the best feeling ever. Within a very short while we were off to the supermarket to buy the much needed food the warehouse was running very short of. So again, with the money raised from the gourmet evening we set off. With two trolley loads of mainly dried food (as they have no cooking facilities) we returned to the warehouse. Within hours all our purchases had been delivered to the refugees. The situation here is absolutely dire and there are now between 500 and 700 refugees hiding out in ditches, woods and parks. Where they are now living is only minutes from the old Jungle camp and is now referred to as the NEW JUNGLE. They are offered a warm meal which is supplied by volunteers at 7pm, that’s if the police don’t stop the distribution, and unfortunately this is a happening on a regular basis. The police can become very aggressive towards volunteers trying to help the refugees and will use tear gas, truncheons and rubber bullets. For the refugees this is becoming a daily routine that the police are brutally abusing them. When we returned to the warehouse all the volunteers had been called out as a call had come through to say the police (again) had been into their camp and removed all the sleeping bags. So every item that we had brought with us was given straight to the refugees which enabled them to hopefully have some protection to the cold nights. We then spent a couple of hours packing 350 essential items into bags that were to be distributed to Belgium as the police had closed down one of the camps and all refugees were now on the streets. I also brought some formula milk with me, hoping to continue to pass on safe feeding practices whilst babies are in these unsanitary conditions. Unfortunately, I believe we are still a long way off from achieving this. Arrived at the warehouse at 9am and were soon asked to get some tarpaulin ready to take them immediately to the NEW JUNGLE. The weather forecast had predicted 3 days of rain. We arrived at the camp where we were met by queues of refugees who always know that there will be some form of distribution at 11am. Sometimes it’s clean t-shirts, socks, hoodies or water. They have no change of clothes or available water or washing facilities to use so these visits each day really are a lifeline too them. So today it was tarpaulins, which were gratefully received and very necessary due to bad weather that was on its way. I then noticed a mum with 3 children so l went over to talk to her. l took her two of the plastic floor mats which will be a lot more comfy than sleeping on the floor. She was very grateful. She looked so sad and l asked her if there was anything else she needed. She just looked down at her clothes and sighed. I told her that l would come back later that day. She smiled as l held her hand and gave her a comforting hug. We then collected 4 young refugee lads to take them to a flat in the middle of Calais to give them a two day respite. They were so excited with just the thought of being able to shower, eat and sleep. They were telling me that they had not slept for 3 nights due to the police’s inhuman violence when they arrived at the camp in the middle of the night to remove their possessions. Their faces were a picture when they saw the food that was put into the flat for them and comfy beds and a shower was like giving them gold. There was also a washing machine to wash the clothes they were standing up in and clothes in the cupboard to change into. How we take our clean clothes for granted. We left the 4 lads actually looking relaxed, relieved and very grateful for having the opportunity to be young teenagers even if it was only for two days. With some of the funds left from the gourmet meal l am hoping to be able to send some money to help with a couple of weeks rent on the flat. This will enable 28 other vulnerable young lads a time to catch up on sleep, eat warm healthy meals and shower as many times as they want over the two days. Pure bliss. Went up to the supermarket again for more food to be distributed. Cleared the shelves of all their dates. We had been asked to get as many as we could as Ramadan is close by and apparently they are an extremely good source of nutrition. We again bought fruit bars, fruit drinks, boxer shorts, socks etc. I then chose a complete outfit for the mum l had seen earlier. This was from money my sister had given me and it was again so rewarding to be able to respond so quickly to a need. Back up to the New jungle to give the clothes to the mum who was quite overwhelmed. I can’t imagine how it will feel to her to put new clothes on and take the horrible dirty ones off. A day to remember. Back in the warehouse by 9am, team meeting to allocate jobs for the day. Some volunteers volunteering to stay in the warehouse to sort clothes etc, some taking buckets of water, soap and towels into the camp for the refugees for a much needed wash. Some chose to spend some time in the deportation centre. We decided to put our names forward for street patrol. This involved taking socks, scarves, water, fruit biscuits etc and taking them onto the streets in Calais. We started in the railway station to await for a train from Lille, then walked around the corner to find a large amount of refugees sheltering in a bus stop. A mum with 3 children looking tired, confused and ready to give up. We gave out our provisions and by far the socks were the most needed. Foot infections are a huge problem mainly due to ill-fitting and wet shoes, so to have a new pair of socks is a really big deal. I started talking to two 20 year old lads. One of them said he was married, as he only looked about 12 l thought l had heard wrong so l said “so you are married”, he said “yes” and pointed to his friend next to him. My first thought was that l am sure if they were in Ethiopia they would have had their heads chopped off. I just said “oh so you two are married”, they both burst out laughing and shouting “no, no, he is married and l am married but not together”. l am really glad they found it funny. 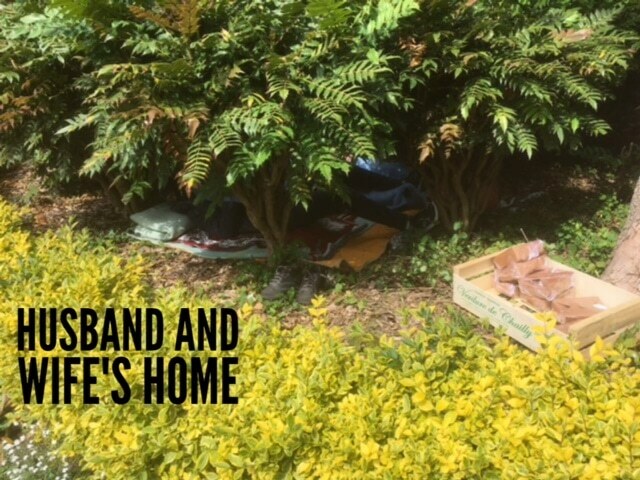 I asked one of them where his wife was and he told me she was asleep in a bush in the park and that she was ill. I asked him if he would take me to see her. I followed him to the park and watched with tears in my eyes when l saw her crawl out of the bush which she calls her home. l lead her over to a park bench. Her husband translated as her English was very limited. It soon became obvious that she had a very bad gynaecological infection that she had been suffering with for over a month. Her husband in his broken English did so well explaining all her symptoms. He then dropped the bomb shell that he thought she may be pregnant. 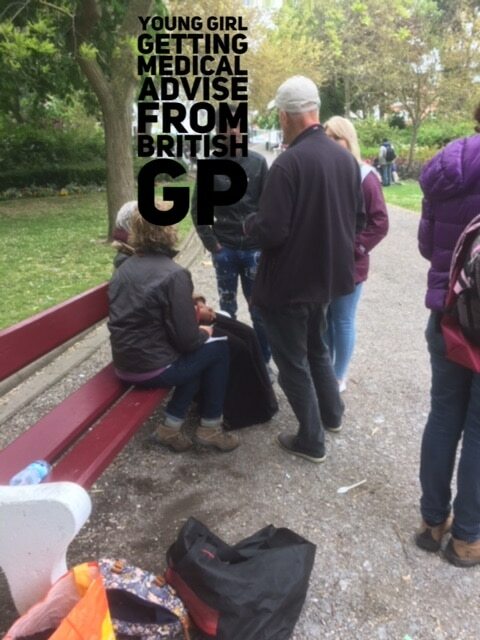 Luckily a retired GP was volunteering for 4 days with Care4 Calais so we contacted him to get his advice. He immediately found his way to the park and spent time with the couple. She obviously needed antibiotics but the clinic was closed for the weekend so he contacted Medics San Frontier for them to take over her medical care. We worked it out between us that she was 11 weeks pregnant. She is 19 years old. Whatever will become of her? I have just heard that MSF did come and help her and she had been housed for two nights by gynaecologist without borders. Unfortunately her husband wasn’t allowed to go with her. And as l leave my heart is full of pain. Can anyone imagine how frightened they must be when light turns to dark. He lays beside his wife and hears her weep. Tearing them from their sleeping bags and pulling them out by their limbs. Wishing l could confront the police but l am not that bold. and I hope that the way they are treated will be banned. Since arriving home I’ve have spent many hours worrying about this couple who had to flee their country as their lives had been threatened by Boko Haram. They told their parents that if they didn’t hand over their house they would all be killed. Both sets of parents made the decision that they had to leave immediately even though they knew deep down they would never see their children again. An unimaginably thought for us all here in the UK. Now home, l have time to reflect on my time in Calais. If l hadn’t written it down l would have got home and would have doubted what I have seen and heard. I think of the fear that they have to endure every day, the uncertainty when they try to sleep at night knowing that the police will most probably arrive, kick them awake and remove their sleeping bags and blankets. Some ripping up their documents in front of them and saying “now prove you are under 18”. How could any of us cope knowing our children or grandchildren are suffering to this degree? Their parents have sold their land and home to give their children a chance of a better life. The parents been told that if they don’t hand over their homes the whole family would be killed. This isn’t an idle threat, many had seen this happening to so many of their friends and neighbours. To close my blog l wanted to leave it on a positive note. l actually do see humanity from friends, family and people l have never met before. They have put up with me going on and on about the unfairness for the refugees. They have given up their time to raise money so I can make a difference to so many. For this l cannot thank you all enough. I get my thanks from holding a hand, squeezing it tightly just to let them know that l care – to see the joy on their faces when l give them a pair of socks or a bottle of water. So thank you all so much l really couldn’t do it without you.